Medical marijuana has been legal in Canada since 2001, but legal recreational use took longer to catch on. 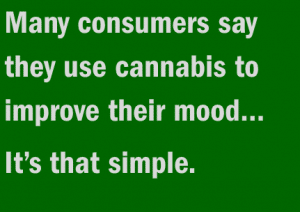 Public attitudes have changed and last year, Canada introduced legislation to allow recreational use. On Oct. 17, Canada joined Uruguay as one of only two countries in the world to legalize pot nationally. The federal government’s push for legalization has already had a powerful effect, sparking a wave of innovation and entrepreneurship that shares the fast-growing, can-do spirit of our technology sector. Our neighbor Canada is the undisputed leader in the global cannabis industry, estimated to reach $32 billion in consumer spending by 2022. This is in large part because marijuana remains federally illegal in the U.S., restricting banks, investors, and stock exchanges from participating in the sector. Canada’s stock exchanges have become the go-to for American cannabis companies. The country’s investment bankers do most of the industry’s deals, and Canada has developed some of the most advanced technology and the largest growing operations. Today, the country has roughly 135 publicly traded companies with a combined market value of more than $46.1 billion. In August, Canopy Growth Corp., the second-largest cannabis company with a market value of more than C$14 billion announced the industry’s biggest deal yet, with a $3.8 billion investment from Corona beer maker Constellation Brands Inc., initiating a stock rally across the sector. Canopy is already the biggest licensed producer in Canada, with 4.3 million square feet of growing space and more than a third of the country’s disclosed supply contracts for recreational pot. It plans to enter the U.S. market as soon as cannabis becomes federally legal. Investment bankers at smaller Canadian firms have ridden the wave of investor mania that’s generated comparisons to the dot-com bubble. 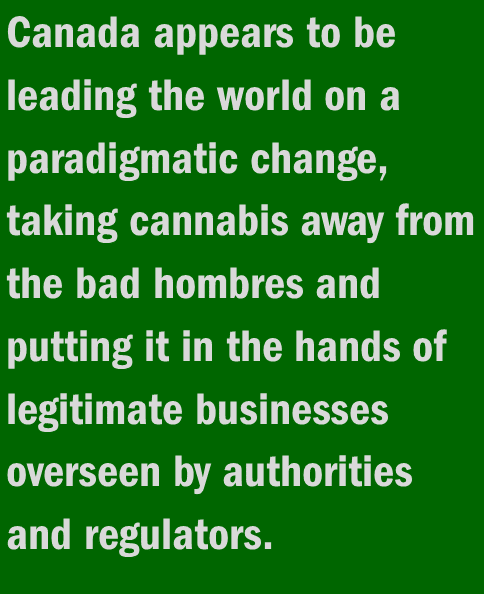 Regulators’ cautious approach to legalization may set the course for the rest of the world. 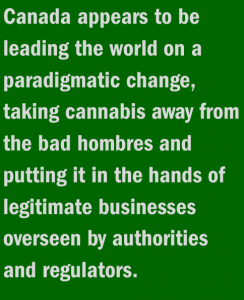 Canada appears to be leading the world on this paradigmatic change, taking this plant away from the bad hombres and putting it in the hands of legitimate businesses overseen by the authorities and regulators. In Edmonton, carefully designed and constructed stores that comply with a long list of federal, provincial, and municipal regulations are popping up. Stores selling marijuana require frosted windows and product vaults, evoking the days when beer was hidden in backrooms; sales staff aren’t allowed to promote products as having medical benefits or inducing certain feelings. Small jars of cannabis are permitted on the floor for customers to sniff, but their contents must then be disposed of in kitty litter, so no one can dig the samples out of the garbage and smoke them. Alcohol retailers may soon discover their sales are being affected, because surveys suggests that cannabis may serve a large role as a substitute for beer, spirits, and wine. The challenge for Canada will be maintaining its early-mover advantage. The country that brought the world BlackBerry knows what it’s like to lose a global leader. If the U.S. government legalizes marijuana, Canada’s stock exchanges and banks will have to contend with bigger, more prestigious competitors and a market with 10 times the population. 39 applications for patents on cannabis-derived drugs to treat everything from insomnia to canine anxiety have been filed. Why? 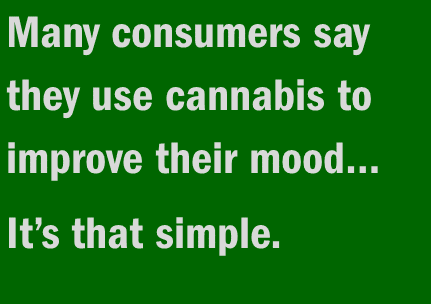 Nearly half (48 percent) of cannabis consumers overall—and 69 percent of daily consumers— say they use cannabis to improve their mood. It’s that simple. Investment opportunities will be abundant if the expected growth of 58% in 2019 continues and new countries around the world open their markets. The information provided is for illustration purposes only. It is not, and should not be regarded as “investment advice” or as a “recommendation” regarding a course of action to be taken. These analyses have been produced using data provided by third parties and/or public sources. While the information is believed to be reliable, its accuracy cannot be guaranteed.